On route to Refuge Mariailles. I know how the horse felt. This is the last stage of my journey. I will at last be in a Mediterranean climate with air temperatures over 40 degrees at lower levels. Some days I didn't take any pictures and I'm now regretting it. 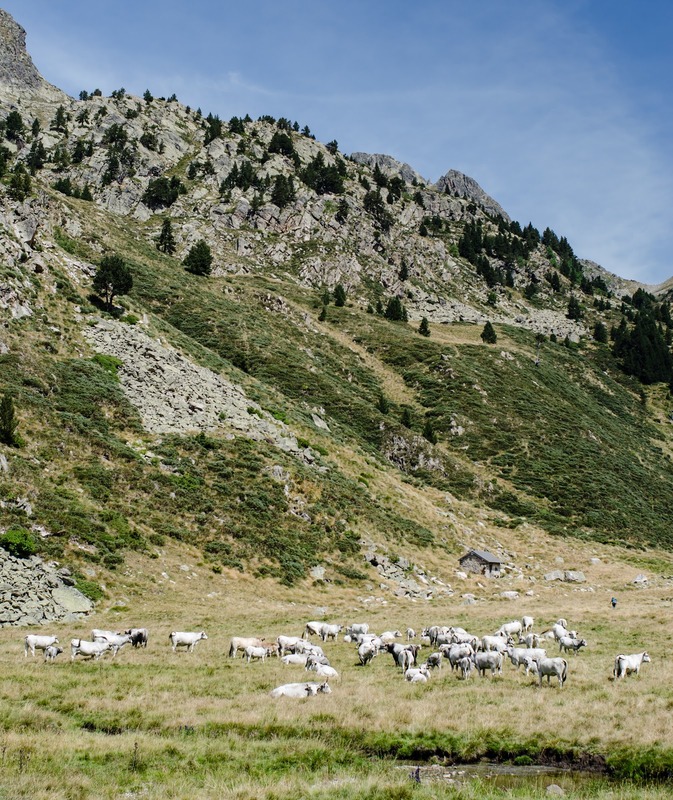 Day 30 l’Hospitalet Pres l’Andorra to wild camp. Cattle near Etang des Besines. The climb out of l'Hospitalet was initially steep but settled into contouring along the valley above the road. I was looking forward to getting away from the noise of traffic. Eventually I reached the lake, Etang des Besines. This is an idyllic spot and a few families were picnicking at the waterside. At the far end of the lake the ground levels to a flat plain where cattle were grazing. I noted a bull among the herd. I passed the refuge without stopping and started to climb towards Col de Coume d’Agnel. I met a lovely couple who had were walking a stretch of the GR7. We compared cameras. The GR7 and GR10 coincide on this stretch. I was to pay for not attending to where they diverge. The HRP also takes a divergent route taking it over the summit of Pic Carlit. Dark clouds were building but I had already decided not to climb Carlit (though in the long run it would have been quicker if I had). I descended to Etang de Lanoux. I continued to follow the red and white slashes marking the GR but was now blithely following the GR7. The route I was on took me into a complex series of cols with a boulder descent into a valley. The route was arduous. The grey clouds didn’t produce rain but the evening and the night that followed were cold. It wasn’t until I had set up camp along the river and started to prepare food that I realised my mistake. I studied my maps closely trying to figure an alternative route that would not involve retracing my steps but it was futile. I was resigned to hauling myself back up over those sharp granite boulders that I had just needlessly come down. 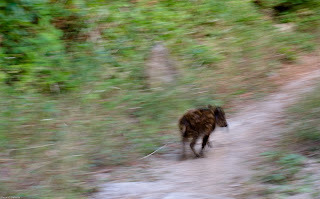 I saw no other human since the couple near Besines and was watching nervous group of Ibex. Day 31, Wild camp to Campsite near Planes. I was glad I had brought a warm jacket. This was the coldest morning yet. I started at first light, feeling philosophical and warned myself not to rush and take risks on this terrain. I was at the col sooner than I expected but the col is complex and the route not obvious. I had to stop a couple of times to get my bearings but was determined to take it a s slowly as necessary rather than risk another navigational error. Eventually I was looking down towards the lake and could see an orange tent that I recognised from the night before. I approached the ten to say hello and ask about the route. The couple were packing up by the time I reached them and I surprised them in a state of undress. They were not expecting anyone to come wandering along that path at that time of the morning. 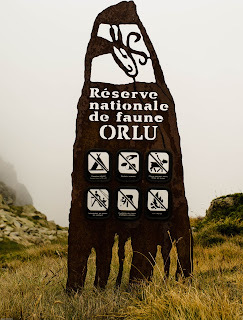 They directed me to the point near cabane de Rouzet where the GR 7 and GR10 merge. I could now see Portielle de la Grave that I should have crossed the previous evening and it was a much gentler route than the one I had taken. Indeed the broad clear path I should have taken rebuked me for my negligence. this is a large rock face. I watched some wild horses as I ascended the col and began the long decent to Lac des Bouillouses. The day was hot but the route was gentle. The lake is massive and the walk alongside it mostly shaded. I reached the Refuge des Bouillouses at lunchtime and decided to eat there. The refuge was busy with day trippers and it took time to get a seat and get served. This was a popular stop with coaches in the nearby carpark. This is a good example of a refuge that isn’t really a refuge but a very nice country pub. I now wanted to make up lost time and decided to reach Planes that day. I had arranged to meet my partner at Amelie les Bains in a few days. The route continued to descend through rough forest tracks. The area was more touristy. Bolquere was impressive for its architecture and I regretted not taking more pictures. These were not curious old buildings but modern heavily build log cabins and massive chalets with large conservatories. Some were quite beautiful though looked as if they had been built for the winter rather than the strong sunlight of summer. I was now at an altitude, about 1500m that I hadn’t been down to for weeks. I had wondered when I would feel more in a Mediterranean climate than Atlantic and expected to notice the change much sooner. It was only at this stage and dropping to this altitude that I sensed the shift. 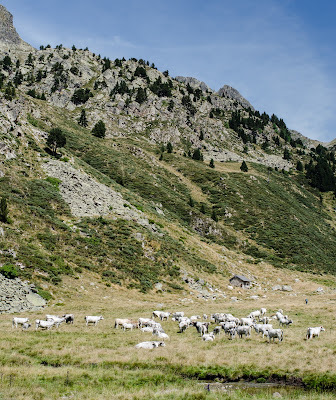 I carried on following the GR10 to a campsite near La Cabanasse. By the time I arrived I was footsore and in need of a shower. It was a small and very welcoming site, though not very well provided. It had few toilets and no shop and was being run by an elderly gentleman who was scrupulous (to the point of irritation) about keeping things ship shape. I had a lovely flat open pitch, enjoyed my evening meal and several cups of tea. I slept well and woke refreshed. Day 32 El Moli del Riu to Refuge du Ras de la Caranca. The day started well with a visit to a shop to gorge on peaches and croissants and stock up with essential pasta and sardines. It was a short walk into Planes but not so easy getting out. The first problem is that the red and white stripes are not where they should be and I suspect a local refuge of directing walkers to its door. Once back on the GR10 the path climbs out of the town to a forest track. Here the path continuing up the hill is not visible and a broken signpost suggests you carry on on the forest track. This is not the way. The actual path starts exactly at the bend in the forest track that you have come out onto. You may need to push through bushes to see it clearly. I assumed for a while that the track had been redirected but it hadn’t though it cost me time before I realised the error. Thankfully the climb to the Pla de Cedeilles was sheltered from the strengthening sun. The decent on the other side was pleasant walking and well marked. 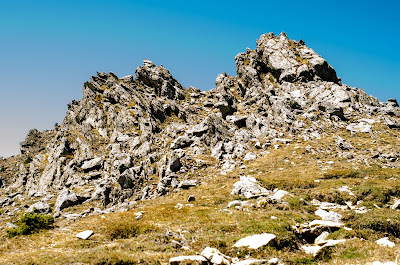 But by the time I reached the ascent to Coll Mitja the day was hot and the initial climb gruelling. Thankfully the steep climb to the ridge takes you into shade. The path is soon crossing the zigzags of forest tracks and sometimes I would just take the forest track for comfort. Similarly the decent on the other side crosses forest tracks. And occasionally the track is the more inviting route. I met a farmer bring cattle up the track and had to take care not to startle them as they passed. A young bull accompanied the cows and despite a verbal language barrier I managed to exchange a joke with the farmer about its endowment. Eventually I reached the plane near the refuge and set up camp. I was disturbed by the evidence of campfires here and even piles of wood left by previous inhabitants. I was just feet away from tinder dry forest and the evening was breezy. A fire would have been a foolhardy risk. I cooked by my tent and didn’t visit the refuge. The potable water supply was a small pipe in the stream. That night I finally made up my mind about cowbells. Romantic associations about the tinkling of bells are common. Often the sound of bells would give you warning about cattle upstream making you take care about drinking. Tonight they were cacophonous, a veritable noise nuisance. I felt sorry for the cattle so burdened who would never know silence. I could understand the farmers view that it helped find cattle and sheep on the hill, but why did every animal have one? I saw sheep with massive bells on that acted as weights to slow them down. I watched one sheep try to sctratch itself with a rear hoof and stop every time it caused the bell to ring. I had no doubt now that these bells frequently caused distress to the animals. Day 33 Refuge du Ras de la Caranca to Py. The day started with the climb to Col de Pal. This was an easy and varied walk through trees and open grassland before becoming stony. 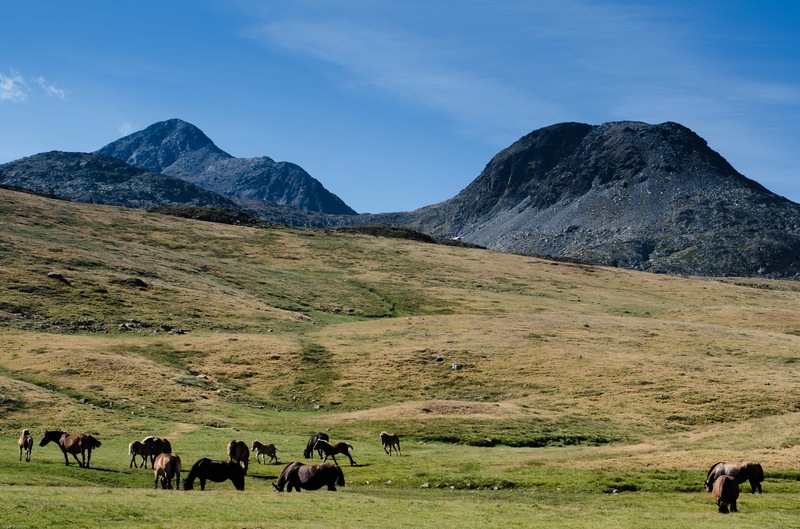 The col itself when you reach it is a wide grassy expanse with glorious panoramic views. It was very windy at the top. I met another walker there where we calibrated our altimeters at the signpost and discussed their value as navigational aids. Many walkers I met carried altimeters but not maps, preferring for lightness to use the French topo manuals which gave detailed altitude profiles. The decent towards Mantet was a bit of a chore. Mantet itself was beautiful but the day was now scorchingly hot. I was footsore and resented the climb through cobbled streets to the restaurant at the top of the village. The restaurant was however a delight. I had a couple of omelettes and sang a Dylan duet with the barman. The route out of Mantet takes you further uphill to the Col de Mantet. This is a short and steep climb and not enjoyable in the temperatures that prevailed. The route down the other side is in the shelter of woodland. It is downhill all the way to Py. I was now down to about 1000m and the increase in heat this brought was noticeable. 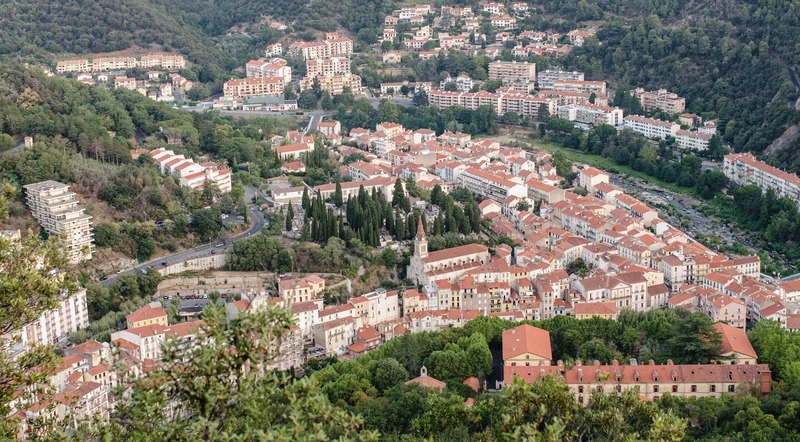 Py is a pretty little village with not a lot going for it from the hiker’s perspective. I bought cheese in a street market but couldn’t find bread. 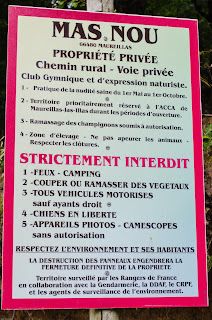 There was a gite but no campsite and no obvious place to camp. I found no public toilets. This is a place the English describe as ‘twee’. On the way out of town I spoke to an elderly gentlemen at a garage. I was sure from my map that it wouldn’t be easy finding a flat pitch. He suggested I camp on a rough piece of ground opposite the garage. This had some unused caravans parked on it and was covered in thistles and nettles. However it was good enough for me. It was only about 6-00pm when I stopped to camp but I saw no purpose in continuing. The next morning I noticed that others had camped in a children’s play park in the town. I needed to find bread before leaving Py. It would take a more than three hours climbing to reach Refuge de Mariailles and I was loathe to do that on an empty stomach. Good luck prevailed. I was up and about early and met an elderly lady attending to her allotment. I asked her where I could buy bread and she walked me to her home and gave me a couple of stale-ish loaves. Manna from heaven, I was on my way. The walk to the refuge was notable for the extensive irrigation channels on the mountain side. Water was being channelled for miles in shallow trenches a that often ran alongside the track. Sometimes the track would be on a low dyke that edged the channels. Stream beds were being used as water was directed from one stream to another. I wondered how much maintenance of the channels was going on as it was obvious that they could be blocked by a very modest land lip or rock fall. The refuge itself was beautiful. A wonderful set of black and white photographs decorated he walls. The warden was welcoming and I ordered an omelette to be eaten outside on the balcony. Unfortunately the refuge is an accessible one and I had to share the balcony with a group of young men skinning up and acting like this was there space exclusively. The warden spoke to them but they were a dull surly lot. The route would now take me towards Canigou, the last big mountain on my route. I had yet to decide whether to take the route over the summit or the much longer circuit that the gr10 follows. It was the heat of the day that decided the issue. 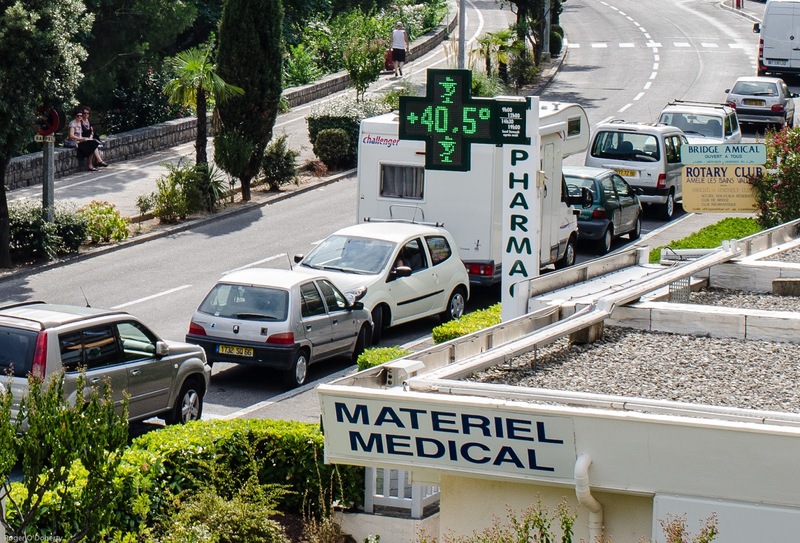 I spoke to a number of people coming from Canigou who told me they had started early to avoid the heat of the day. The temperature was well into the 30s so I went for the circuit. This path is not an easy option. 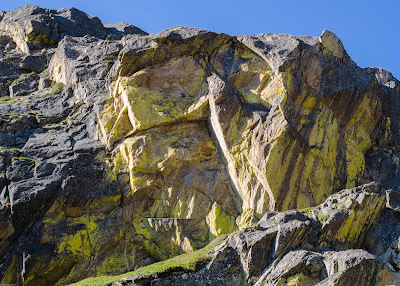 Apart from being a much longer route it contours around he mountain going in and out of every gully and crossing countless scree slopes and rock falls. Most of these have well flattened and visible paths through but it is still possible to lose the path. 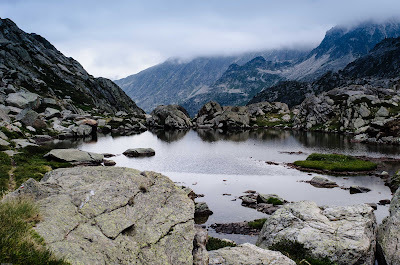 It was about 67-00pm when I reached Refuge de Bonne Aigue. This is an unstaffed shepard’s hut and a family were in occupation. I hadn’t been intending to use the hut but wanted a flat area near it to camp and to make use of the water source nearby. The only flat spot for a tent was on the edge of the forest track running past the refuge. This had clearly been used before. The views from this spot are exceptional. I was invited into the hut by the family for a cup of coffee which I gladly accepted and enjoyed teaching their child a few words of English. My attempts at a singalong were a bit less successful. Day 35 Bonne –Aigue to somewhere between Batere and Arles sur Tech. A vast sea of mist filled the valleys next morning with the most magnificent cloud inversion. I was so pleased to be above it. Mountain peaks looked like islands and valleys and gorges, fjords. The day would start with a climb before dropping to refuge de Cortalets. I hoped to do this stage quickly so wasn’t planning to stop on the ascent. Just at the orry (ancient cabin) I met Carlos. I asked him about the path ahead and he replied, ‘let’s have a cup of tea’. He dug out his stove and I dug out my tea bags and we had a wonderful chat about the hills, photography and life in general. He was a very skilled photographer and carrying an even heavier camera than mine. He told me of his visits to England and photography workshops he had attended. On the decent towards Cortalets I met a steady stream of people heading up Canigou. One man asked me if there was a water source ahead. He was climbing the mountain on a scorchingly hot day with two children and no water. I told him about a water source mentioned in the guide book but advised him to return to the refuge and stock up with water there and start again. I thought the risks of dehydration and exhaustion were all too real. I refilled my bottle at the refuge and carried on. Canigou is a massive mountain. In reality I had been on it since shortly after leaving Py and would still be on it when I reached Mines de Batere. The path continued to contour around the hill. Many of the streams were dry but occasionally the path would cut into a gully blessed by the water god and crowned with trees. At one of these I stopped and met two women who at first seemed to resent my intrusion. 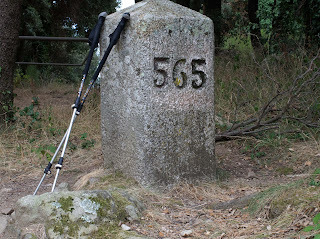 They told me they had walked from Hendaye and when I mentioned that I was following a similar trail their mood relaxed. Carlos had told me of a hippy camp between Batere and Arles sur Tech where he had stopped and I shared the information with them. The climb to Batere is through trees which provided welcome shade but the day was starting to cool by the time I was in the open again. I was now very conscious of the scarcity of water. The ground levels out on a grassy plain and there is a water pipe flowing from a stream by the path. Another couple were already camped there and though tempted to stop, I decided to carry on. I was ahead of schedule and would reach Amelie on time. I called at the Gite hoping to eat there but they were not serving food yet, so again I carried on. The path continues through a long valley. A long dry valley. I kept a look out for water and flat ground to pitch on but found nothing until I reached the place Carlos had told me of. The people there were very welcoming but were themselves short of water and worried about being able to stay there for much longer without it. They were mostly local people who had cars and were able to fetch what they needed. I was given a large bottle of chilled water and camped nearby. I was up and gone in the morning before my hosts had risen. Day 36 to Camping Vallespir. Over 40 degrees at 4-00 o'clock. I continued down the path towards Arles. I was approaching civilization. I was dropping in altitude, Arles is below 300m. Evidence of mountain biking and campfires was frequent. However as I walked along I heard shuffling in the undergrowth and as I looked I disturbed three young sanglier, the first I had seen on my journey. I even managed a rather blurry photograph of one. I hope the hunters don’t find them. I walked into Arles and took the road to Amelie. 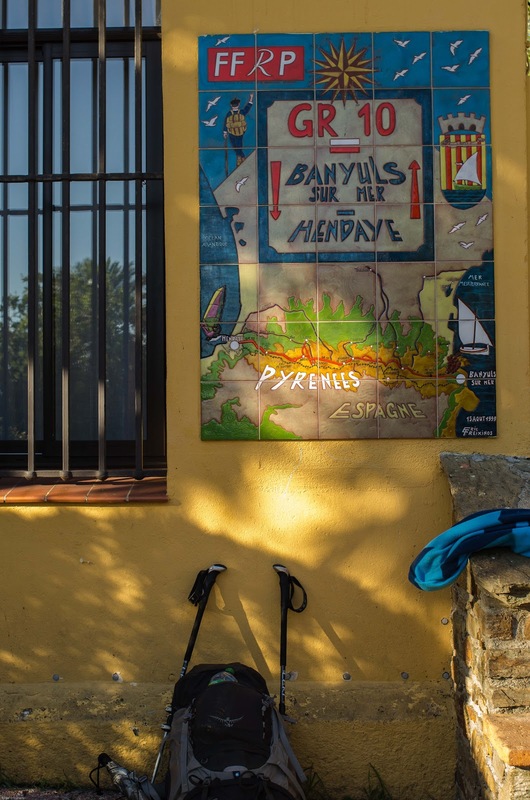 About halfway I arrived at Camping Vallespir and booked in. This was a welcoming family campsite, but it is probably not the best for hikers in the area. It was expensive at 20 euros per night. The pitches provided little shelter from the sun. It was close to the river where you could swim and had a decent cafe. By lunchtime my tent was pitched and I was tucking into a pizza. My partner would arrive the next day and I had 24 hours to rest, wash and clean some clothes. I was somewhat lighter and hairier than when we had parted nearly 6 weeks earlier. Jane arrived the next day on a 1euro bus from Perpignan. She had booked an apartment for 10 days starting later that week so that we could have a holiday together at the end of my walk. 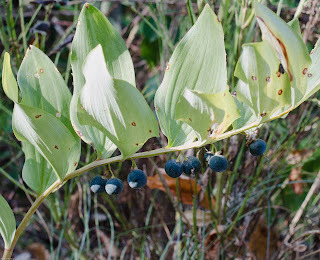 The temptation to hang around for a few days was strong and with temperatures now in the low 40s, irresistible. We spent three nights in the campsite and moved into the apartment. The weather forecast that evening was for a cold front bringing rain and strong winds over the next few days. This offered a big improvement on the heat wave and I set off the next morning to complete the walk. I anticipated completing in three days but did it in two. The day started with a long slow climb out of Amelie to Roc de Frausa (Roc de France). This follows the original HRP route and has many redundant faded markers on it. The climb is gentle, through woodland and easy to follow. Near the rock the path meets the redirected GR10 and there is no obvious route through to the rock. This is the international boundary and the HRP at this stage crosses into Spain. True to form the GR10 backs away from anything so daring. I met a couple of walkers doing a section of the GR10 who had come up from Arles. 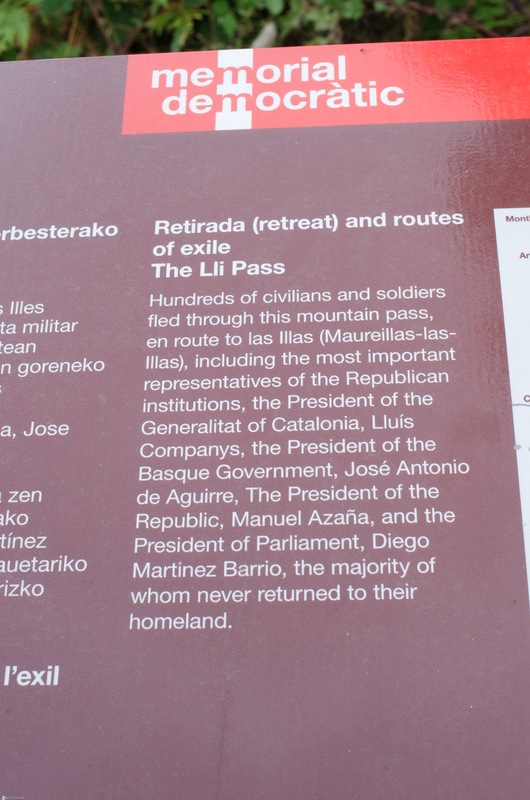 Their plan was to carry on to Col Del Pou de la Neu, cross into Spain and return into France at Coll de Lli. 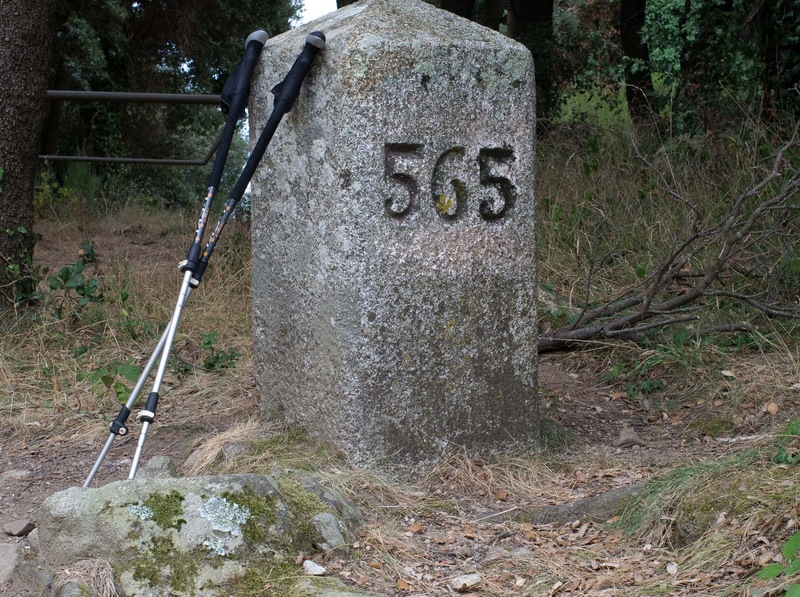 So even committed GR10 walkers were using the more interesting and shorter routes that crossed into Spain. I wished to walk alone and parted company with them. The route around to Coll de Lli is unexciting being mostly through forest and on forest tracks. The col though was for me both the dullest and most interesting of the walk. I couldn’t recognise it as a col at all, It was a route through an old gate at the back of a house. 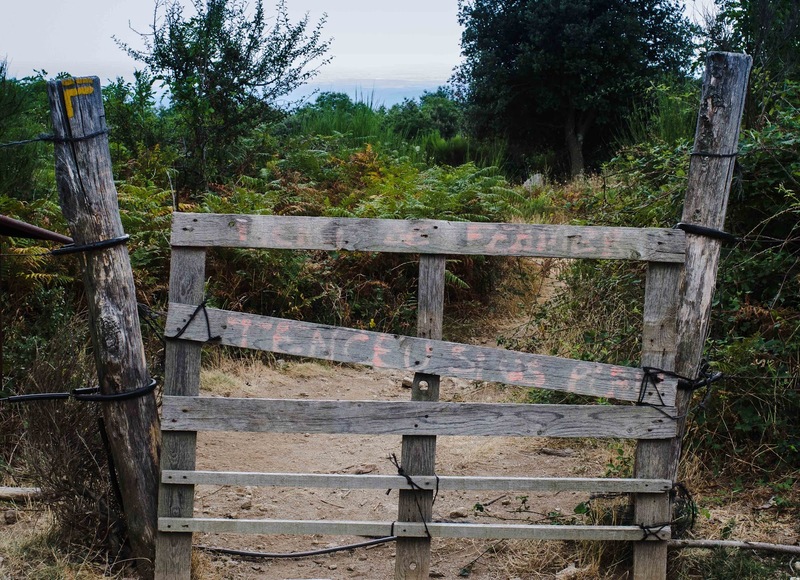 But this gate had been the escape route for many Catalan republicans escaping Franco to the nearby village of Las Illas in France, their welcoming place of refuge. Memorials have been placed on both sides of the fence and only these memorials indicate to the passing stranger that this is an international boundary. This was the only crossing of the boundary I found on my walk that was indicated on the ground and that is a tribute to those who resisted fascism. I carried on to Las Illas but didn’t stop. The promised rain arrived but didn’t slow me down. 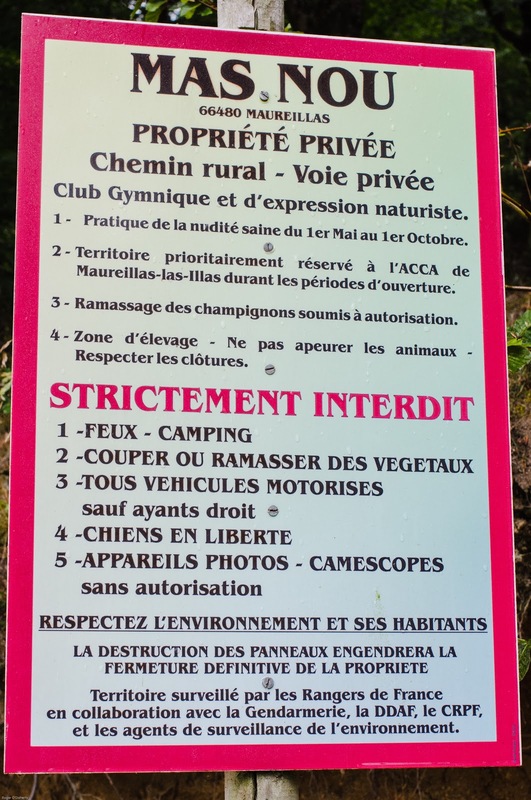 Here the walk took me through a naturist reserve where signs warned me not to take photographs. The rain and mist would anyway have frustrated any attempts. The permissive path through the reserve lasts for 5 kilometres through which I did not meet another person. The path then drops down to the road and leads to Col del Perthus. There is a military fort and cemetery and a number of historical remains. 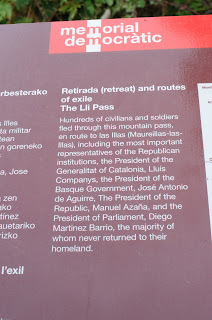 I had braced myself to expect the worst of Col del Perthus having read about it as a border shopping mall on a motorway. Yes the road was a bit disturbing but I was able stop to buy food and eat some fruit and get out of the town easily without trauma. I was very satisfied with my progress but it was evening and I decided that I would camp now where ever I could find a suitable spot. I took the D71 out of Perthus. The road climbs in zigzags across a steep slope and I was beginning to worry if I would find a safe place to stop when I came to an old disused barn. There was a flat area to the rear of the barn where I was able to camp. The wind was strengthening and I was glad to have some shelter from the building and put out some extra guy lines. As the sun set I had an amazing view back across to Canigou. 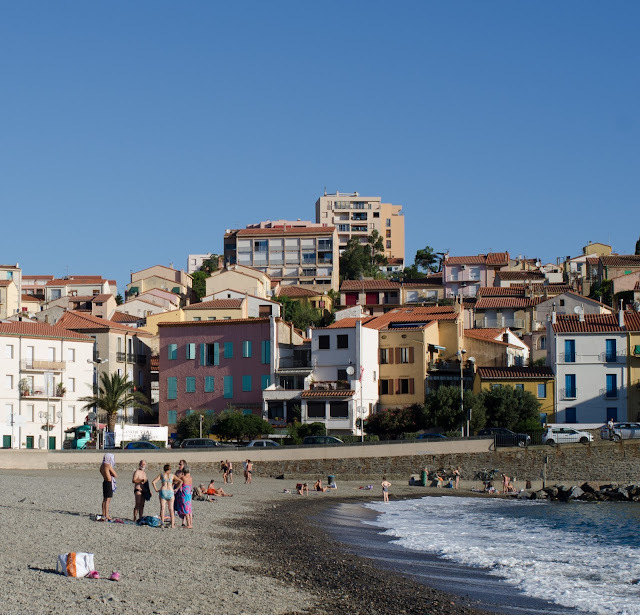 Day 38 Wild Camp to Banyuls Sur Mer. I started early and was confident I would reach the sea today and texted Jane to let her know. I continued up the road for a while before entering woods where the track was poorly marked but made my way through to Saint Martin de l’Albere. 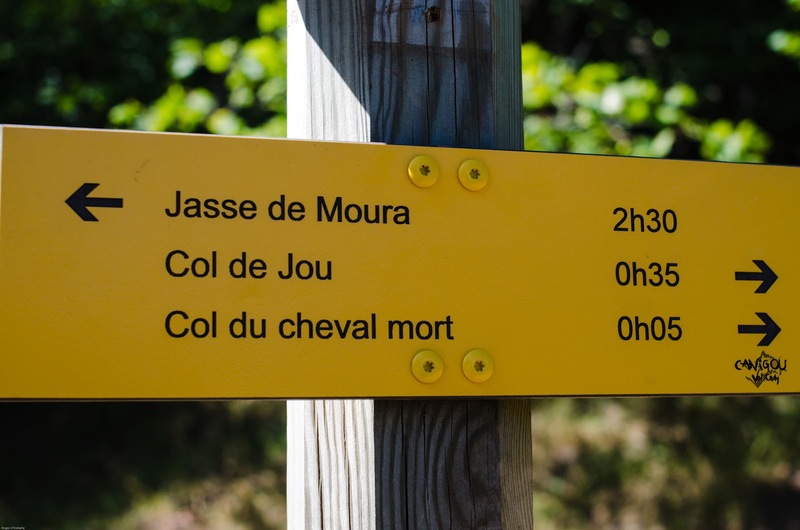 I was now following signs for the Gite on Col de l’Ouillat leading up a wooded slope. This was another refuge with road access and true to expectation the day trippers were gathering and the bar was doing business. I stopped to refill my water bottle but was not inclined to stay longer. The path carried on uphill and turned towards a transmitter mast at the summit. From here I had my first view of the sea. 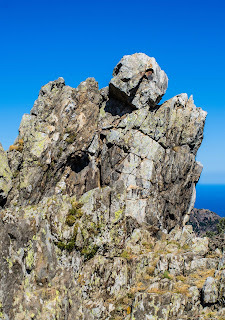 The route from here to Banyuls is magnificent and follows a ridge most of the way. The path remains high (relatively) providing excellent views across flat lands of southern France and northern Spain. The route hugs the boundary which is marked by old rusting fenceposts. I found the geology reminiscent of Cornwall with great outcrops of rock, though mostly limestone rather than granite. I took lunch in the shelter of an outcrop at Pic Quatre des Termes where the wind threatened to clean me off the hillside. The sun was bright and the wind was punishing. This last day was not going to be an easy downward saunter into town. It was long and challenging and when I reached the campsite at Banyuls my legs could take me no further. The last couple of miles were on road and only the sight of the sea mitigated this. The campsite was on barren stony ground (where seeds wither and die) and I had trouble getting pegs into the ground. A pizza van was based on the site so I was able to eat and have a couple of beers (to replenish minerals) before bedding down. I didn’t go straight to the sea, I left that treat until morning. I had arranged to meet Jane at Colioure up the coast from Banyuls and would get a bus. 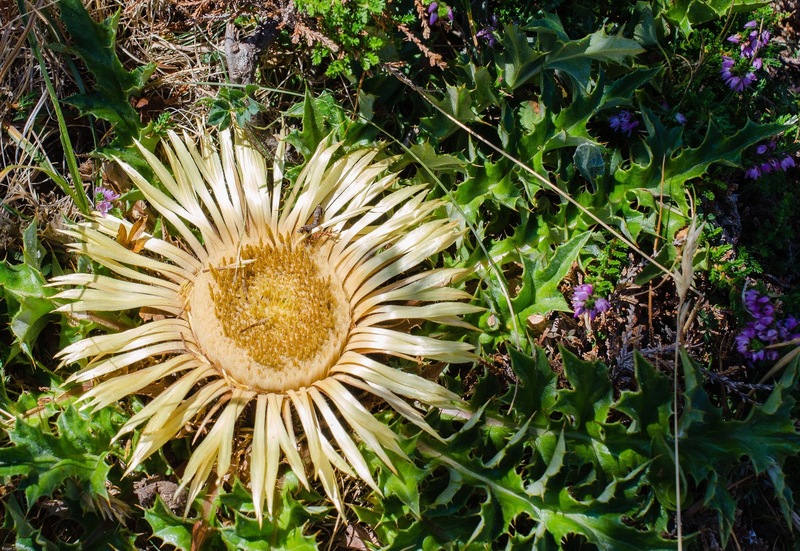 I had actually considered changing my route at the end to drop down into Collioure rather than Banyuls, but having had Banyuls in my sights for so long couldn’t do it. I do think it is an option though. My experience next morning was different from the accounts I had read of other walkers. Helpfully the campsite provides a street map showing the shortest route to the shore. I arrived early when few people were on the beach. There was no brass band waiting for me and I will have looked odd compared to the few people around sunbathing but I didn’t have to pick my way through crowds to reach the water. I knew something about myself now that I didn’t know before. I knew I could walk from the Atlantic to the Mediterranean along a 500 mile chain of rugged mountains. A certain song by the Proclaimers filled my head. I’m often asked how my gear worked. It all worked well though I would make different choices with hindsight. The one piece that failed totally and potentially very expensively, was my camera strap. This was an expensive Black Rapid Sport used by professionals. On my second last day the shackle holding my camera came apart through wear and dropped my camera on the ground. Thankfully this was on soft grass and not steep scree where I might have lost it completely. It was a new strap at the beginning of the walk. By the end it was scrap. Check out the panoramic view here The original is a 45 mega pixel image. Great stuff Roger, I wish I could do that walk, but I know I'd end up like the camera strap! It is an interesting thought, I don't think I could have done it 10 years ago.It really is much more about being a stubborn bugger than an athlete. Good job on finishing, Roger. Agree entirely on stubborness being the chief prerequisite!